One of the servants of Fate/Stay Night, Rider is a vigilant servant who is very loyal to her master, Mato Shinji, despite being unable to provide her with mana like the other Masters. Her true identity is Medusa, the Gorgon from greek Mythology, although she does not posses Medusa’s trademark "snake-like" hair. She does, however, have very long hair and blindfolds herself to keep her Mystic Eyes, Cybele, from petrifying anyone within her range of vision. Luty sent me this cosplay after I said I needed to find other cosplays of other character from the series, Fate/Stay Night. Thanks for sharing! The Magic Knight of Water, Ryuuzaki Umi is an only child who is quick-tempered and reluctant on fulfilling her role as one of the three Magic Knights of Cephiro. During her journey to becoming a Magic Knight, she often wished to return home because of a fencing tournament she is participating in. It is this desire that prevented her from becoming a true Magic Knight, but she overcomes it eventually and revives her rune god before Hikaru or Fuu. Beautiful cosplay! I believe she’s using her natural hair or some hair extensions, but I like this cosplay a lot even without the blue hair. Great work! In the Ah! My Goddess! TV Special, Belldandy becomes temporarily evil when an angel eater captures Holy Bell and the child-form of the devil Hild implants a Tsukaima egg in her to see if she will turn from being a goddess to a devil like her. This is quite a unique rendition of Belldandy. I really love her shoes, but it must be a pain to walk around in those. Nice job! The older twin sister of Tsuakasa, Kagami (who is sometimes referred as "Kagamin") is a friend of Konata’s and Miyuki’s who loves to read light novels and play shoot ‘em up games. She is in a different classroom than the other main characters of Lucky Star; much to her distress since she even chose the same course in her second year in hopes of being with them. Kagami studies very hard and is somewhat egotistical. Konata often pesters Kagamin to allow her to copy her homework or tutor her when the exams and/or the due date for summer homework is just around the corner. Cute cosplay. I found this when I was browsing through Photobucket. I wonder who the cosplayer is? 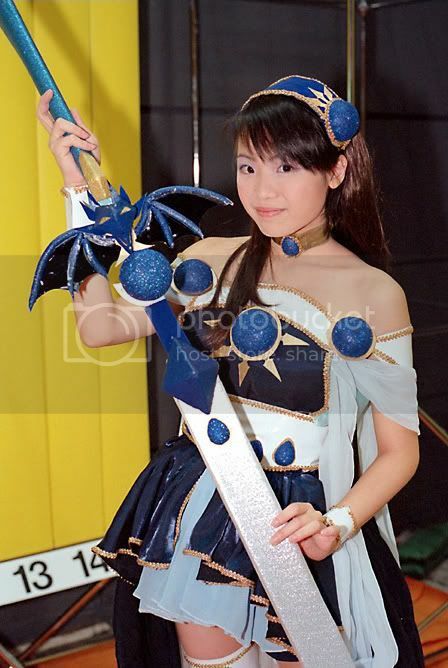 You are currently browsing the Nanao’s Cosplay Research weblog archives for December, 2008.